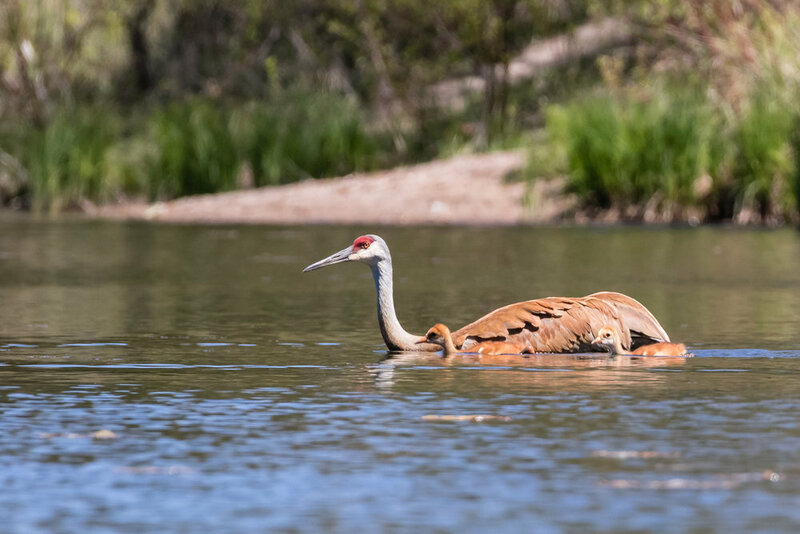 This is the second year I've photographed Sandhill Cranes. These birds migrate north to nest and raise their young, and this year I followed a pair in Port Franks and another in The Pinery. They are large and majestic, with plumage that blends with the grasses and wetland areas where they build their nests. 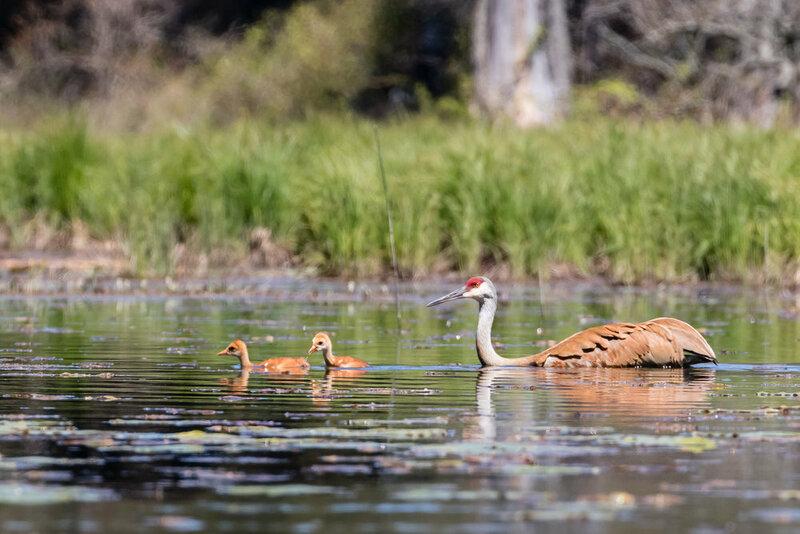 Sandhill Cranes are the only member of the crane family that is now off the endangered or threatened list as their population is slowly but steadily increasing. In the wild they can live for 20 to 30 years. Cranes feature prominently in both Asian and Aboriginal art and symbolism. 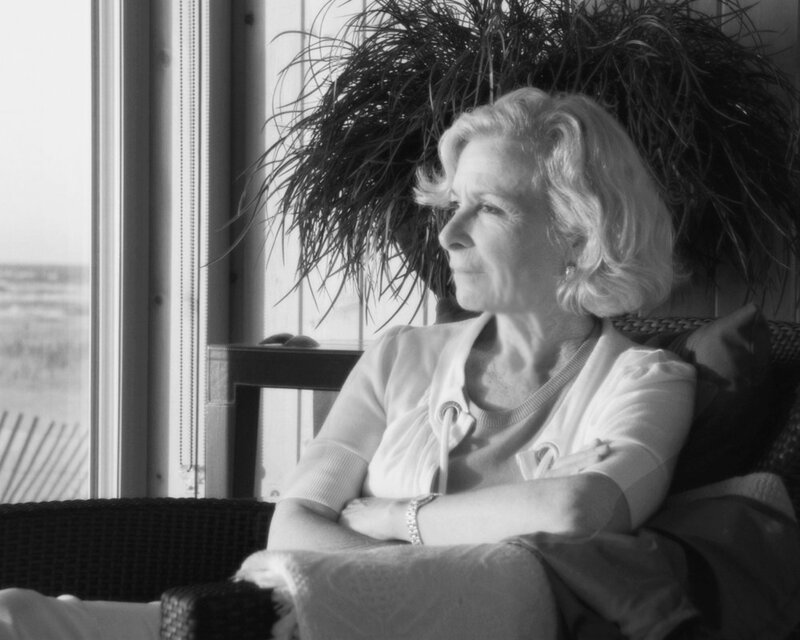 They are associated with royalty, balance, grace and longevity. It is believed that an encounter with a crane can be a powerful experience, pointing the way to the achievement of balance and good fortune. 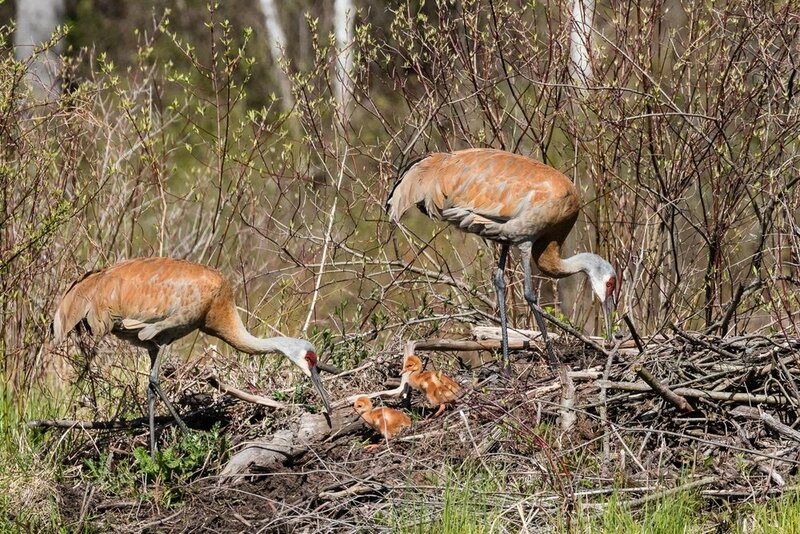 Cranes are also depicted as creative, with an ability to focus, and as problem solvers and wise teachers. They are seen as loyal. Nest building occurs in the early spring when the wetlands are still covered in dead stalks, reeds and grasses from the previous year. The nest is built close to the water and large enough to keep the eggs dry. Normally two eggs are laid which will hatch in 29-32 days. Sandhill Cranes mate for life. Both parents build and maintain the nest, and both sit on the eggs. When it's time to change places on the nest a specific set of behaviours occur. The nesting bird stands up, bends down to the eggs, and moves them around a bit. The other bird, usually some distance away, starts to walk toward the nest. 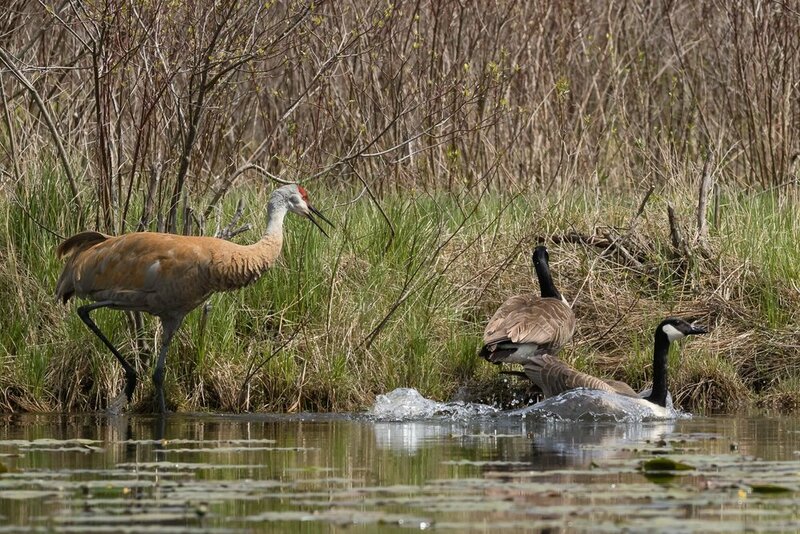 Once there, both adults spend time minding the eggs, cleaning up the immediate area and adding grasses and sticks to the nest. The bird who had been feeding and wandering nearby settles down on the nest. The other stays for a short while, eventually wanders off, and then takes flight. 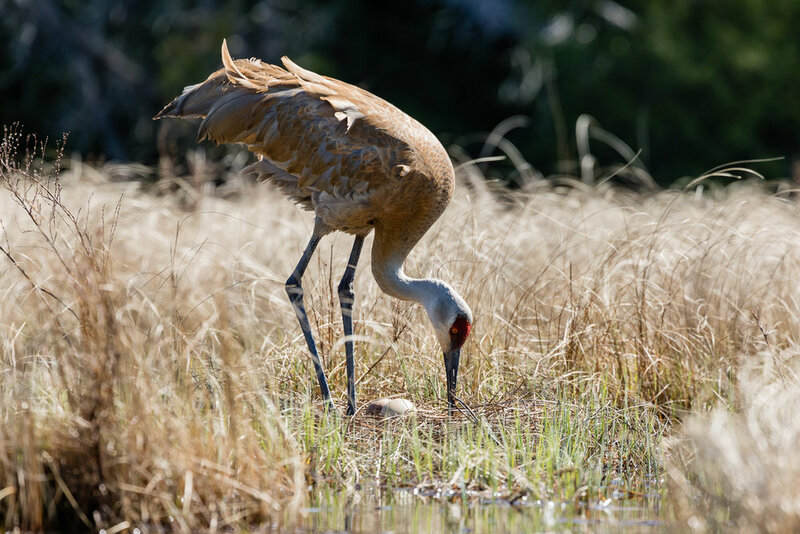 Sometimes Sandhill Cranes are tolerant of other birds but often not. I've seen them aggressively chase the Canada Geese away and yet the next day be indifferent, even when the geese are close to the nest or the chicks are near by. If it's territorial behaviour it's not clear to me what triggers the aggressive mode. Many shots this year were taken from a canoe, and that offered closer and better access. The birds were not concerned. They ignored the canoe and its participants, giving us opportunity to photograph them closer than we could have done from land. Seeing them up close made the experience even more powerful. Once the chicks are hatched both parents remain close by. Neither takes flight, both alert to what's happening with the chicks and on guard for predators. The chicks, covered in soft yellow down, leave the nest within a few hours of hatching and are capable of swimming. They sleep under their mother's wings for three to four weeks. In their first month they run, flap their wings and eat food provided by their parents. 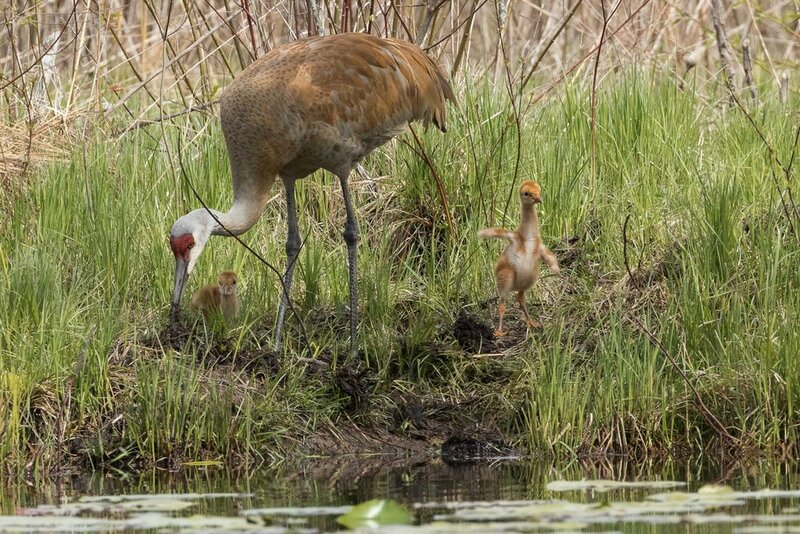 In the second month they learn to dance and begin pre-flight training. In the third month they learn to forage on their own, dance, practice take-off and landing skills, and fly with their parents. By the end of the summer they are ready to migrate south with their parents. But once they're fully mobile it's hard to find them. Cranes are known for their beautiful spirited dancing, something I've not yet seen. As part of their mating behaviour they leap, run, twist their bodies and flap their wings in powerful movements. One year I hope I'll be fortunate enough to see that. But for this year I've spent more time watching and photographing them than the year before, I've seen the nests survive a wet spring and rising water levels, and watched the chicks get stronger and more active over the first ten days of their lives. And seeing them cross the river, one parent leading and the chicks swimming close to the other parent, was wonderful. I've learned more about them; It's been a joyful few weeks. 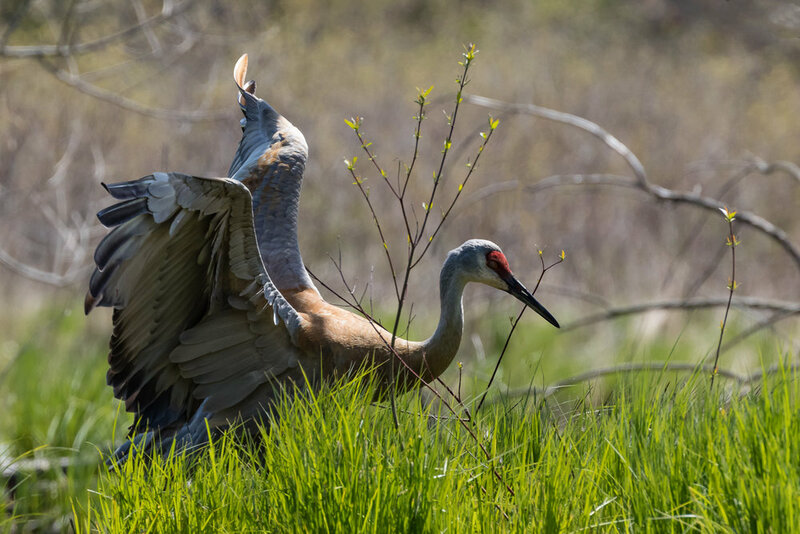 Sandhill Cranes: big, beautiful birds. Symbols of longevity, loyalty, creativity and focus. Having watched their behaviour I understand why.